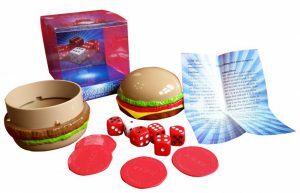 Dice fun in a burger bun. Fyzuntu is a captivating and innovative take on the ancient game of dice for 2 to ideally 4 but could be more players. Score a Hexagon ( 30 points from 5 sixes) or a Super Hexagon (42 points from 5 sixes and a six on the Joker dice). At the other extreme you could roll a Coconut (0 points from five dice) or a Coconut Plus, (score zero and to their delight give all the other players 10 points). 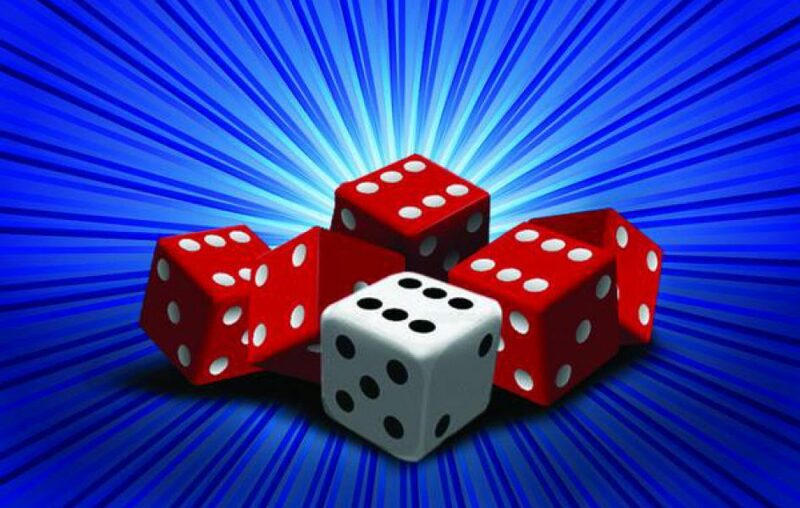 A Round of Play continues as long as one player has a red dice. The highest score wins. If you have any queries regarding the rules in English, French, German, Italian or Spanish, please contact us using the form below. 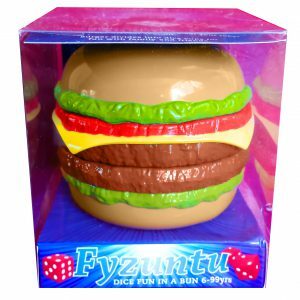 The game is enclosed in a burger bun, which doubles as two dice cups and comes complete with the special Fyzuntu dice, tokens and game rules. 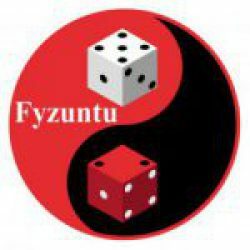 Fyzuntu should help youngsters over 6 years old (and some adults too!) improve their mental arithmetic, whilst frequently revelling in beating those same adults in the game. The Retail Price is £9.99 or sometimes even lower on Amazon. It is an ideal pocket money gift, birthday or Christmas present that can be played anywhere and takes 20 to 30 minutes to play, say, 4 Rounds. © 2013 Fyzuntu Games – all rights reserved.